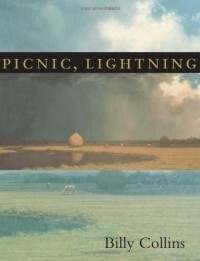 Picked up this collection (Picnic, Lightning - Billy Collins) at the local library semi-annual book sale. It was day 3 of the sale, with paperbacks down to 50 cents, so I was surprised to come across this find. The local university (UNCW) has a pretty good writing program, so I figured all the good books would be gone -- scooped up by undergrads looking to impress, or grad students, looking for inspiration. But Billy Collins remained, much to my delight. This is an old University of Pittsburgh Press edition (1998), so maybe anyone who wants it already has it, except me and the person who gave it up, though I now have it, too, feeling much the more richer than my benefactor, yet I hope Collins' words remain with my new kin whose volume now belongs to me. I started in as soon as I got home, jacket on the floor, and found that Collins never fails to deliver (I suspected, and expected as much, which is why I was so delighted at the find). As I read these poems, I feel more than a bit like the subject of the introductory verse, "A Portrait of the Reader with a bowl of Cereal," my "spoon dripping milk, ready to listen." Lead on, Mr. Collins, lead on. I'm all ears.